This is the May 2015 Google Algorithm Weather Report, here you will find the latest news in the ever-changing world of SEO so you can keep on top of all the changes. This month we’re looking at doorway pages, ranking factor lists, Penguin & Panda, the Google/Twitter deal, Webmaster Tools, the “Phantom Update”, and Emojis! Details on what Google defines as a Doorway Page. After Googles initial statement about Doorway Pages, webmasters were left confused as the definition was not very clear, so much that many webmasters were not even aware that the Doorway Page algorithm had come into effect. Google SEO On-Page Ranking Factor List 2015. User Martinibuster on Webmaster World wrote a revised list of on-page SEO factors that he believes are important in 2015, and factors that he thinks are less important. Other uses stated that Mobile Friendly Design and Schema should be added to this list, which many webmasters and SEO’s will agree with. Google’s John Mueller states they are working on making Penguin & Panda run faster, again. John Mueller stated that they are “looking for ways to make Penguin and Panda a little bit faster to update data” in a recent Google+ Hangout after a frustrated webmaster queried him about the algorithm. This isn’t new to anybody, as we heard the same thing back in September last year , but of course we will be keeping our eyes on this as best we can. Google mobile search gets tweets from Twitter. 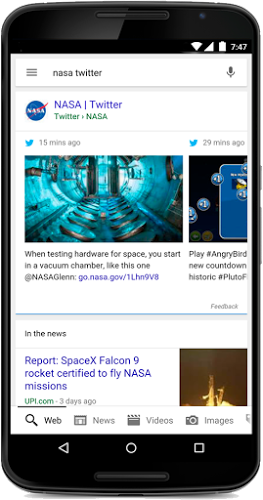 Google and Twitter renewed their search deal allowing tweets to be displayed in search results in real time, and we have now finally seen the first screenshots of the new (old?) feature. We can’t recreate this, as it seems to be a US-only feature right now, but we are confident it will be rolled out to UK SERP’s very soon. Google Webmaster Tools is now known as Google Search Console. Google has renamed ‘Google Webmaster Tools’ to ‘Google Search Console’ in a bid to not exclude non-webmasters, as the tool is also used by hobbyists, business owners, SEOs, marketers, programmers, designers, and app developers. Functionally there is no difference between the old Webmaster Tools and Search console besides the branding. Google: Yes, there was an update early this month. Despite previous indications by Google that Emojis would be making an exit from Google’s search results, they continue to live on. Just when we will see the disappearance of the colourful characters is unknown at this time, as all Google have said is “soon they will not be shown at all”.